Our enterprise is specializing on manufacturing bulletproof doors, burglary proof doors, bank doors, vault doors, fire doors and of course apartments entrance doors. We are situated in the capital of Ukraine, the city of Kyiv. We started working with doors in 1998. Our enterprise commenced to produce professional security doors at the premises of the plant that at his time had worked for the USSR defense industry. Now, having access to various production facilities, firing grounds and laboratories we are able to develop, test and produce virtually any type of door at customer's option. We manufacture the doors of virtually any complexity. You can see us testing the security doors. Our doors can be bulletproof (1-7 class), burglar (1-6 class). Doors for bank vaults can be burglar and blastguard (1-9 class). The most popular model of doors is called BODYGUARD™. This is defence door, which combines burglar-resisting, bulletproof-resisting and fireresisting properties. 3 in 1. Also BODYGUARD™ doors have very good level of sound insulation, which totals from 40 dB (standart model of BODYGUARD™) to 43-44 dB ("warm" door BODYGUARD™ for private houses). Besides excellent level of sound-proofing in our doors, we reached on our last tests of "warm" door, which taked place not long ago in december, 2015, supreme level of heat transfer coefficient U ≈ 0,9 W/(m2•K). It is great achievement! The standart model of BODYGUARD™ have U ≈ 1,33 W/(m2•K). 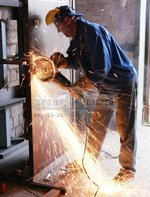 For example: 95% of metal doors from other fabricators have only 1,66 W/(m2•K). It is least level, which is required according to Ukrainian law.